Shannon O’Keefe, O’Fallon, Illinois, has been unanimously voted as the May 2018 Kegel Bowler of the Month by the International Bowling Media Association. O’Keefe bookended the month with two PWBA wins, the Sonoma County Open and the USBC Queens. In her PWBA Sonoma County Open win, O’Keefe ran the stepladder finals starting as the fourth seed. She ousted third seeded Ida Andersson, Sweden, 226-160, second seeded Shayna Ng, Singapore, 214-186, and in the one of the most exciting title matches of the new PWBA, the top seed Verity Crawley, England, 268-266. After O’Keefe spared in the first, she and Crawley traded nothing but strikes until the ninth frame, when Crawley spared. O’Keefe struck in her ninth frame, then spared in the tenth. Needing a double to win, Crawley spared, giving title to O’Keefe. The McKendree Univerity women’s bowling coach then won the USBC Queens downing Bryanna Coté, Red Rock, Arizona, 221-189. The stepladder finals began with fourth seed Stefanie Johnson, McKinney, Texas defeating no. 5 Amanda Fry, Antelope, California, 200-172. 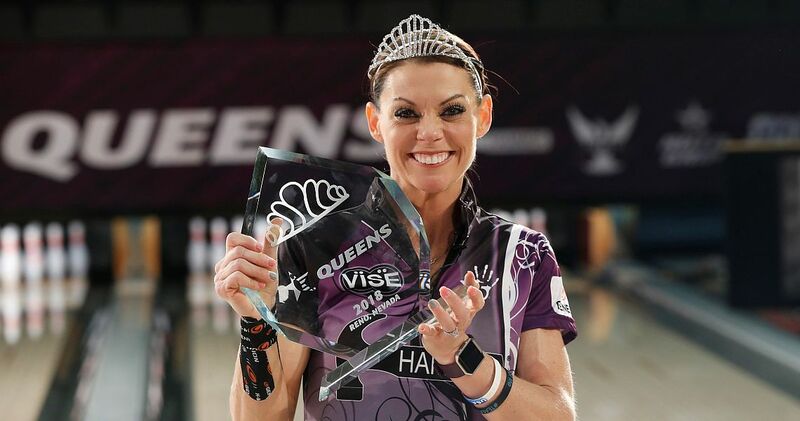 Third seed Liz Johnson, Palatine, Illinois, ousted Johnson 232-212, then second seed O’Keefe outlasted the two-time Queens champ 247-224, setting up the tilt for the tiara with Coté. Also receiving votes this month were Cristian Azcona, winner of the PBA Xtra Frame Wilmington Open, Annop Arromsaranon, winner of the 2018 PBA-WBT Busan Cup, Michael Haugen Jr., winner of the PBA50 Johnny Petraglia BVL Open presented by Brunswick, and Brian Voss, winner of the PBA50 Mooresville Ford Open presented by Columbia 300.